What is Practo Clone Script? 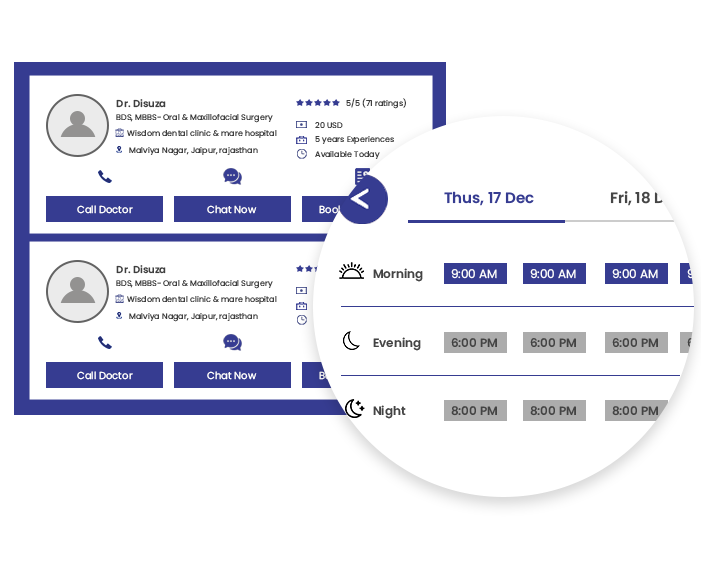 Practo Clone Script is a one-stop panel for Patients, Specialists, and Clinics/Hospitals/Home Healthcare Providers. 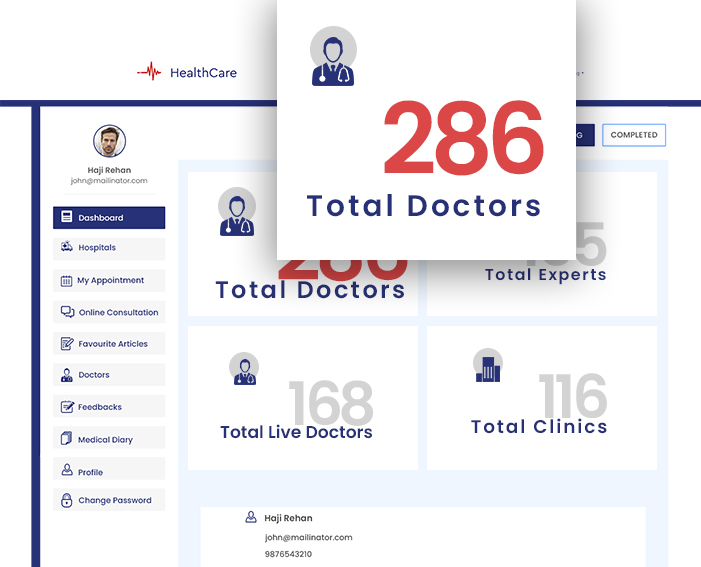 This platform allows doctors, patients, clinics & hospitals to communicate or connect with each other. It is the trusted and common home where patient know they'll find a recovering touch, get right authority, getting meds, securing prosperity records, etc. Hoping to build up a Zocdoc Clone Script ? A genuine medicinal informal community accessible for human services experts, that interface patients and specialists. 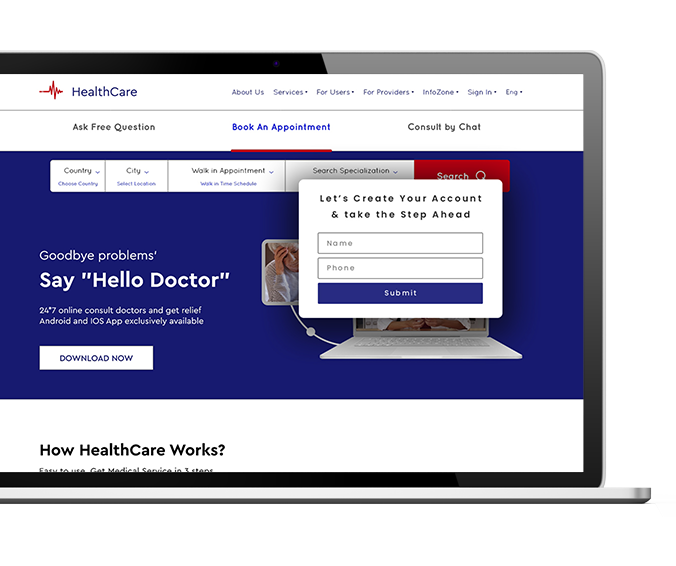 Zocdoc Clone Script enables patients to discover and book meetings with specialists, advisors, and wellbeing experts.It provides expert advice, health tips through Health care Articles for Patients/ Article Readers. Patients can aquire all the services they can keep their Medical Records Documents upload and safe. 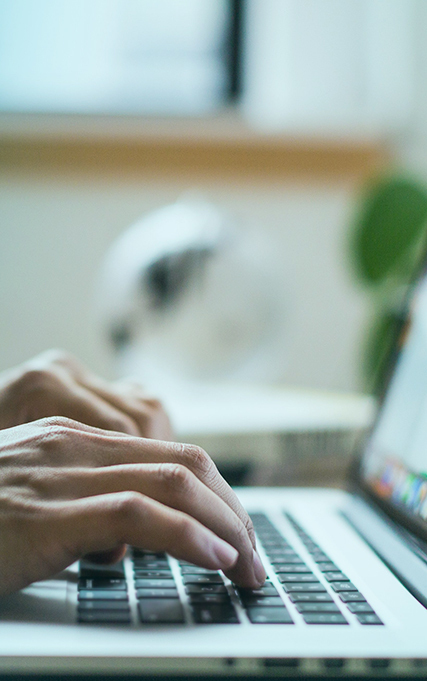 Our talented assets have figured out and built up the finest Zocdoc Clone Script content that enables you to do precisely the same, and significantly more through customizations. Search Doctors/Hospital By Speciality, Services with advanced search Options. The organized search module gives users better experience. 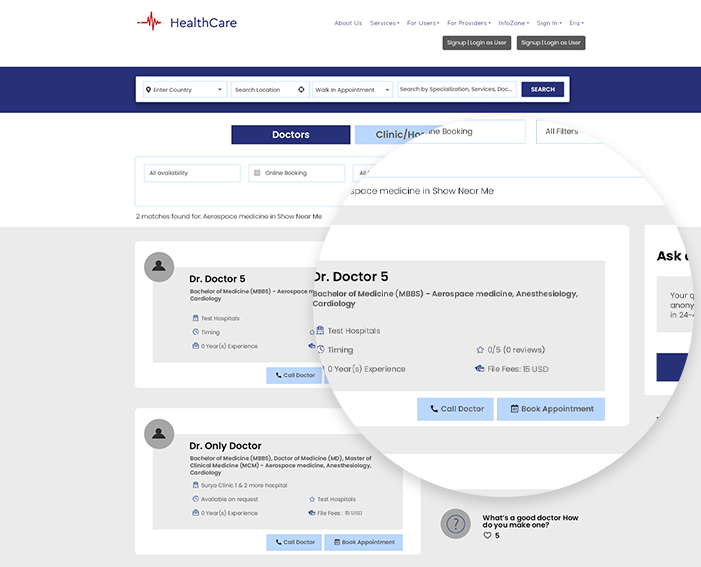 Patient can see Current Booking and Past Appointments. 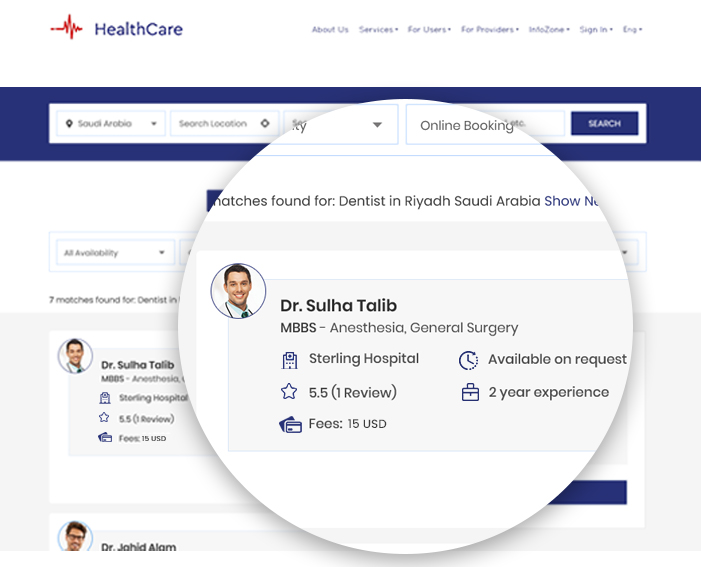 All upcoming and completed appointment history will help patients to plan accordingly and also they will be able to Write Reviews for all completed appointments. 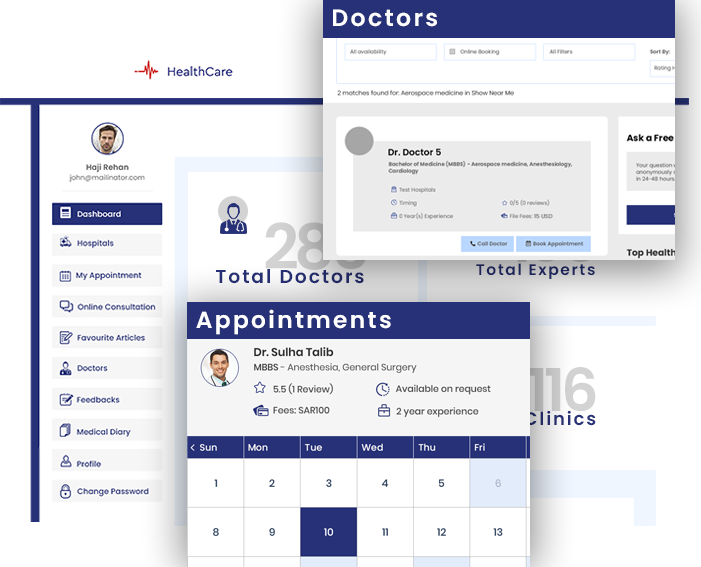 Patient dashboard contains all favorite articles & doctors, All service requests, Online consultations, etc. 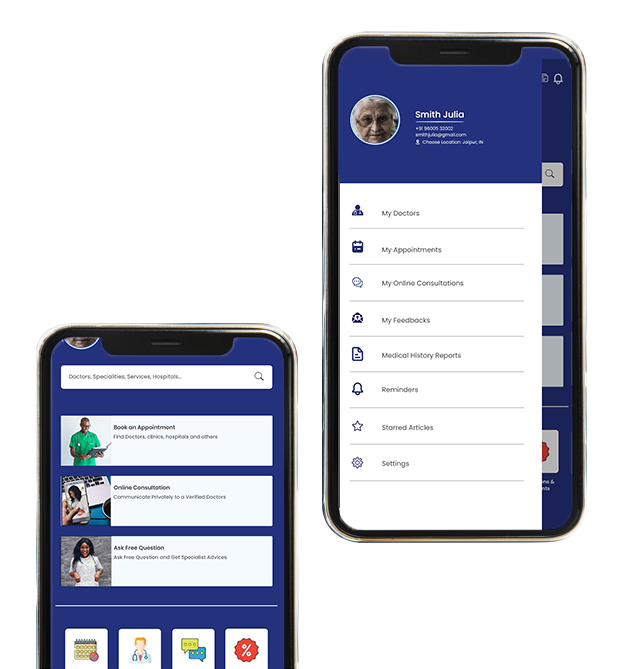 Savvy dashboard gives straightforward access of arrangements, Manage the Hospitals/Doctors/Patients/Home HealthCare and availability and manage their Payments and Appointments. Easily Manage upcoming/ completed Service Requests, Timings, Chat with patients and Admin can manage home health-care service requests, Payment and Refunds. Admin can Manage the Site Examination and Reports; he can manage the site budgetary experiences. 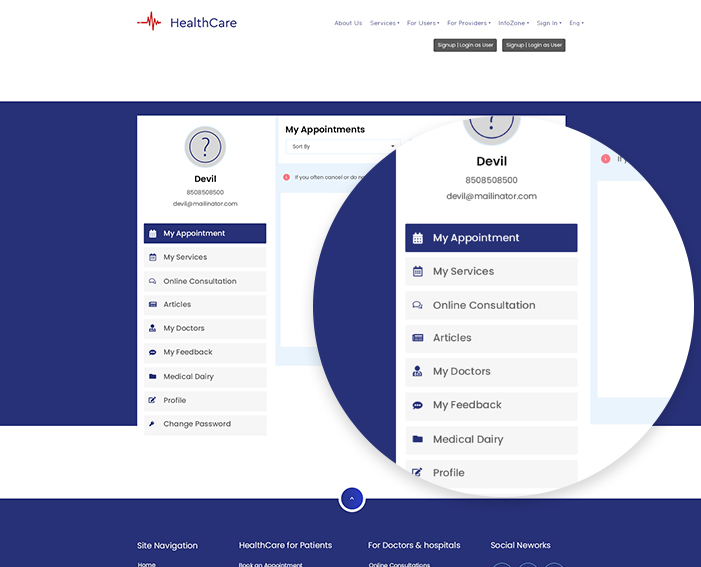 Admin can manage the All Appointments/Users and CMS pages. Responsive segment gives a perfect survey experience to users with Optimal Viewing, delicate look and feel and also experience with all screen sizes of mobile. Find fitness center listing with call now option. Manage service request, payments, & refunds for home healthcare. Enroll for a FREE DEMO today! Disclaimer Policy: Kindly note that the popular term 'clone' used is for representational purpose only as this is how the 'development of a solution similar to another' is refered to. Planet Web Solutions Pvt. Ltd. certifies that the entire design and code has been completely developed and built by our own inhouse team of designers and developers for all the readymade solutions, scripts and software. No code, design or any element has been or will be used from any website/solution similar or unrelated to the offered Solution's concept. Thus, the clone solutions developed by Planet Web Solutions Pvt. Ltd. are only inspired from prevalent proven internet business model referred to, and the reference to any particular Solution/Website is only to help identify the nature of our Solution/Script. The respective Solution/Website/Software referred to and all company names & logos (other than that of Planet Web Solutions Pvt. Ltd.)mentioned are the trading names, service-marks or trademarks of their respective owners alone. Without limiting the foregoing, if you believe that your work has been copied and posted on the Service in a way that constitutes copyright infringement, please provide us with the following information: an electronic or physical signature of the person authorized to act on behalf of the owner of the copyright interest; a description of the copyrighted work that you claim has been infringed; a description of where the material that you claim is infringing is located on the this website; your address, telephone number, and email address; a written statement by you that you have a good faith belief that the disputed use is not authorized by the copyright owner, its agent, or the law; a statement by you, made under penalty of perjury, that the above information in your notice is accurate and that you are the copyright owner or authorized to act on the copyright owner’s behalf.